This week's new design, you may have seen in the shop, but I don't think I've shared it with you all yet. This comes from a Victoria Secret inspired Bridal Shower request. It's hard to see by the photo, the cover is using some new metallic cover stock I've recently added to my cover supplies. This one is plum purple. 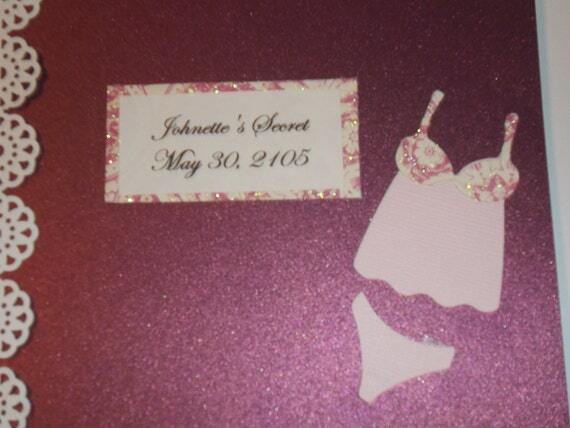 I've used some glitter embossed designer paper to accent the name card and the top of the lingerie. With the evenings getting darker here in the fall I have to rely more on the ceiling lightening in my basement studio rather than the sunlight from the windows. My photo box was packed away a few months ago in anticipation of selling our home-- of which still hasn't happened and we've seen some great houses with wonderful spaces for my new studio slip away because our house hasn't sold yet. So I hope you'll bear with me through some of my dark photos right now as we hope and pray for someone to come buy our house and are able to transition to a new space. Hopefully, this close up is a better photo. Can you see the shimmer of the metallic? This guest book is made to order, so you get choice of cover color, and your inside page design. Next week is Thanksgiving. We're staying home and enjoying some good ole family time together for the day and some good food. My husband cooks a mean turkey dinner, if I do say myself. I, of course, am in charge of the dessert this year. It wouldn't be Thanksgiving without a pumpkin pie in our house. Are you staying in this year or going out? Either way, have a warm and happy gathering.